Look away now of you can't handle the fish. 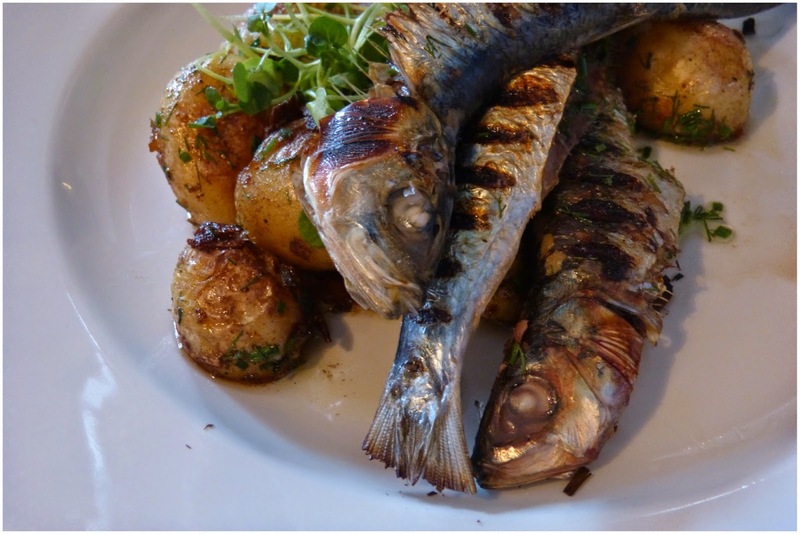 Luckily I can, because this week's star dish is the grilled sardines, watercress salad and garlic roasted new potatoes from the talented folks at Fishers Restaurant in Clifton, Bristol. Use the menu on their site as a little taster because I think everything made in this place is whatever is in season [my little sardines are not listed] which I am all for. I also have to call out that these were the best tasting new potatoes I have ever had so far in my little life. They are that good and as such deserve their own little shout-out. A nice little treat after visiting my grandma. Dad had the mackerel which I tried and also super delicious - if you're not a fan of bones in fish, I would opt for this over the sardines. But basically, order whatever your fish-loving-hearts desire, you can't go wrong.